I'm Not Even Supposed to Assess Today! Q.L.A.P.Pp (Quiescence, Lacinia, Assiduousness, Puerility, and Pano poo) is an acronym I created as an easy way to remember my growth in China. My goal is that after reading my advice you too will carry it with you in future travels and pay it forward. The beauty of the QLAPPp is that it’s something that, once you learn it, it stays with you forever. Quiescence: A state of quietness or inactivity. Studying Chinese in college appeared to be only an advantage in theory due to my pervasive fear of sounding ignorant to a native speaker. Whether it was tones, grammar, well-timed grunts on the phone, or saying a prayer for Mao, there were always many things standing in the way of perfection. My reticence led me to a state of ‘quiescence’ and it took me too long to figure out that only speaking perfectly may lead to not speaking very much at all. The first major lesson I learned in China, other than green on crosswalks is equally dangerous to walking on red, is that people will misconstrue my words no matter what language I speak and that I should at least endure with confidence. For this, I leave a picture of a young man who doesn’t care what he sounds like from a British-made English textbook for Chinese kindergartners. With a new sense of enthusiasm to try/make mistakes I was able to experience more. The months following my arrival in Nanjing was fraught with learning new things everyday, not unlike learning the meaning of ‘lacinia’. I was able to discover my new favorite foods, make friends that will last beyond my stay here, and even improve my teaching skills significantly. I accomplished all this with an open mind, often stumbling forward blindfolded in hopes of adventure, like my first time unhooking a bra in the dark. 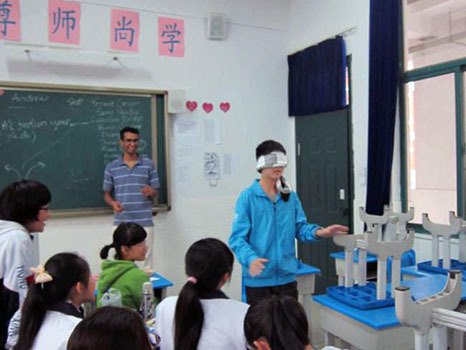 For this, I leave a picture of a class where I taught directions in English using an obstacle course. Aside: At first glance, the ‘L’ may seem like the weakest part of an otherwise flawless acronym, comparable to the Leaning Tower of Pisa if it didn’t lean or the Colossus of Rhodes if it had 13 toes, but the truth is, choosing ‘lacinia’ goes beyond a complex word utilized in the most contrived way possible. Unlike the other words, the usefulness of learning ‘lacinia’ can’t be predicted. Some things are only useful in certain contexts, be it botany, zoology, or China, but learning them still makes you a more well-rounded person. You’ll likely not grow from learning ‘lacinia’ however. As is often the case with most things in life, desires, like objects in motion, will eventually slow down due to inertia. Cultural differences were less novel, favorite foods lost the quintessential flare from the very first bite, and the reaction to a beautiful Chinese temple became steeped in languor or sarcasm. Somewhere along the way I lost the spirit and that feeling of stumbling forward blindly became accidental habit, like a bald man who keeps buying shampoo. The word ‘assiduousness’ describes not myself, but the world I perceived around me. My goals became obscured as if by smog and I was only living in China in name alone, instead of living in the Mountain Dew sense of the word. I was a world away from my old life, but I was as apathetic as the summer before arriving. I would say I had managed to find purgatory in paradise, but I would assume people in paradise are less liberal about spitting on the ground. For this, I leave a picture of a sunny day in Nanjing juxtaposed by its engulfment in hazardous-level smog. Puerility: The state or quality of being a child. Just as easily as I had become the background character of my own story, I decided that I alone had the power to change it. With my Lunar Year spent traveling around Asia I returned with renewed ambition and ardor. I delved back into the language, started applying to get involved through volunteering, and my writing once again took a more central role in my life. I remembered that the greatest fake Chinese love story involving a married woman who made wraps ever told was born not too long ago and new inspiration was born. My apathy was the reason China became monotonous and I knew that I had to rediscover for myself the wonder in the simple, ‘puerility’, like a child in a cardboard box or old ladies and mahjong. For this, I leave picture of children playing in plastic balls. Pano poo: The Hawaiian word to describe that feeling when you forget where you’ve put your keys, and you scratch your head because it somehow seems to help your remember. I can barely keep track of all the moments that have contributed to my personal development and I often find myself in a state of ‘pano poo’ when reminiscing the causes. The time I was held hostage on a bus simply because a Chinese girl lost her wallet. The time I witnessed a mother hold her peeing baby over a basket, also on a bus. The countless times I’ve lost touch with friends, because they got off the bus before I could ask their names or even talk to them. My desires go beyond these moments, however, and the horizon is still visible despite the pollution. I want to make a difference in the community and give a speech at a Chinese wedding. I want to do sword dances with old women in the park and do jumping jacks under the bridge with the same old women when it’s raining. My return to America will mark an end to these opportunities. For this, I leave myself open to the rest of my travels.